All in a Day’s Work iPad Sleeve from Kate Spade is an attractive tablet sleeve compatible with the Apple iPad 2 and the new iPad with or without the Smart Cover. Built to protect the device from minor impacts and scuffs, the new case will also safeguard the tablet from scratches thanks to its soft interior lining. 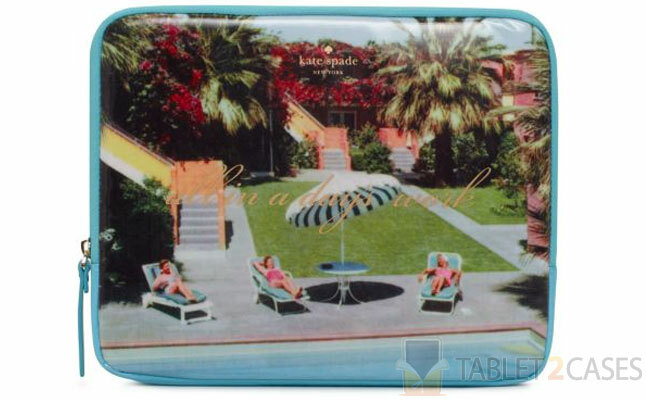 The new iPad case features a cool vintage photo of ladies by the pool, which the manufacturer claims they found at a flea market. In any case it’s a great theme and would certainly brighten up any iPad’s day. The designer’s logo is embossed on the cover of the case. The case offers a perfect fit ensuring the tablet doesn’t feel to wobbly inside. The double zippered closure ensures the new Apple iPad 2 case always stays firmly shut when not in use. The simplicity and functionality of the case will surely attract many iPad owners looking to guard their devices in a unique way. The price for this case is $50.